Thanks Derz! That fish was less intimidating than I expected him to be. Kylindar challenging the Kung Fu Master Yagudo Champion! 3) Shadowsoul stabs my heart while im medding with raise sickness. The part I referred to in Glory, the movie, is this scene. The name of the song is called "Charging Fort Wagner" by James Horner. HEY I see birdman (Aid)! I can't find that song derz, I could attempt to do-dee-do it which would be no help (dun dun, dun dun dun dun DUNT DUNT) XD I can tell you it plays at the intro of (i think the first song) of the ozzy osbourne randy rhodes tribute cd lol, got that tape when i was home with the chicken pox in like 5th grade and listened over and over. He plays it live before beginning the song, obviously NOT an ozzy song. I think its like some ancient battle hymn. I'll find it eventually. Maybe i'll have to rent glory. No More Tears by Ozzy Osbourne? lol no randy rhodes tribute is much earlier. No more tears didn't come until f-zero for snes was released, I remember turning off the game music and listening to that cd then ^^ We're talking like the legend of zelda era for the tribute tape (we didnt have cds yet). Movies, music, and video games.. that's all I remember, everything else is repressed. 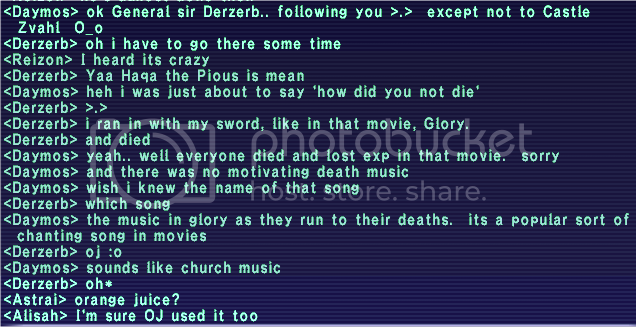 Anyways, why would there be an ozzy song in Glory?